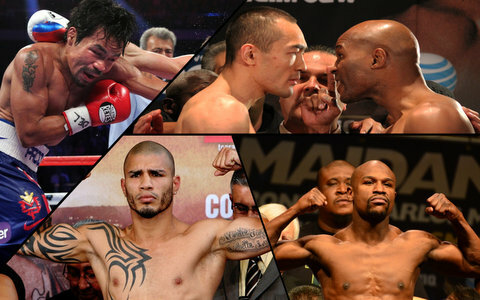 The Year in Review: Six Notable Fights in 2014 - Part I — Pacquiao, Hopkins, Froch, More! In this two-part review, I chronicle six of the most anticipated bouts of 2014. In Part I, I cover three key fights from the first half of the year. In Part II, I describe three fights from the remainder of the year and list match-ups that deserve honorable mention. I selected each of these contests based on their ability to produce drama, historical significance, and/or sustained action. In addition, I emphasize tilts with pound-for-pound and title implications. Summary: After losing his WBO title to Timothy “Desert Storm” Bradley (31-1-1, 1NC 12 KOs) by split decision in 2012, via of one of the worst boxing decisions on record, Manny “Pac Man” Pacquiao (57-5-2, 38 KOs) looked to set the record straight by removing Bradley from the unbeaten ranks. Although Pacquiao had more knockouts (38) than Bradley had pro fights (33), Desert Storm entered the rematch confident that he would knock the Pac Man out. When Bradley, 31, and Pacquiao, 36, met at the MGM Grand Garden Arena for the second time, it was clear that both men were all business. Round 1 got off to a fast start with both fighters trying to find their punching range. However, Bradley landed the first meaningful shot of the fight — a straight right hand to Pacquiao’s head that backed up the Filipino icon. Bradley continued to attack Pacquiao over the remainder of the round and built an early lead on the scorecards. In round 2, Pacquiao zeroed in on Bradley’s chin and tagged Desert Storm with a hard left hand to the chops that wobbled the champion. Though the two combatants exchanged heavy leather before ending the second stanza, it was clear that Pacquiao was gaining momentum. Round 3 was difficult to score featuring back-and-forth action highlighted by power shots landed by both fighters. At the end of the round, however, Bradley’s body began to breakdown as he complained of fatigue and a pulled (right) calf muscle to his trainer Joel Diaz. Bradley sucked it up and landed several solid punches to Pacquiao’s body and head — one of which picked the Pac Man up off the canvas for a split second — that secured the 4th and 5th rounds for Desert Storm. In middle rounds, Pacquiao picked up the pace and became the aggressor, while Bradley began to fade. Bradley also tried to goad Pacquiao into a brawl, but he was unsuccessful in most of these instances. By the 9th round, the Pac Man had taken command of the fight. Bradley frequently missed with his punches and Pacquiao thwarted many of Desert Storm’s advances with fast-twitched combinations. In the championship rounds, Pacquiao could smell blood in the water. As Bradley’s stamina continued to dissipate, the Pac Man took advantage of his adversary and piled up points on the scorecards. Despite Bradley’s spirited effort in rounds 11 and 12, Pacquiao would avenge his “loss” to Desert Storm by earning a hard-fought, unanimous decision win in the rematch. In the process, the Pac Man regained the WBO title and notched his second consecutive victory. A November bout against unheralded Chris Algieri (20-1, 8 KOs) loomed in Pacquiao’s future, but boxing fans clamored for the long overdue mega-fight between the Filipino champion and boxing’s top dog, Floyd “Money” Mayweather (47-0, 26 KOs). Bradley, who was classy in defeat, remained idle until December when he faced Diego Gabriel Chaves (23-2-1, 19 KOs), of Argentina, in a 12 rounder. Summary: The early rounds of this contest were tough to score, with Bernard “The Alien” Hopkins (55-7-2, 2 NC 32 KOs), 49, and Beibut Shumenov (14-2, 9 KOs), 31, feeling each other out and throwing few meaningful punches. Nonetheless, Shumenov’s pressure helped him build a lead on the scorecards by the end of the third round. Hopkins took charge of the fight thereafter by capitalizing on his opponent’s mistakes. Making Shumenov miss and pay for his miscues, with well-timed counters, occurred with increasing regularity. By the middle rounds, Shumenov’s frustration was mounting and his face was marked up. B-Hop, on the other hand, was getting into a comfortable groove that allowed the 49-year-old champion to set traps and lure his younger foe in. By the 11th round, Hopkins was in complete control, while Shumenov was wearing down. A hard right hand, set-up by Hopkins’ jab, downed the Kazakhstan-native and whipped the crowd into a frenzy as they chanted, “B-Hop! B-Hop!” Shumenov returned to his feet and finished the bout, but it was clear that Hopkins was the superior fighter. When the final scorecards were read, Hopkins led on two of three cards (116-111, twice). It was judge Gustavo Padilla’s inexplicable 113-114 scorecard (for Shumenov), however, that drew the ire of many in attendance. Thank goodness that two judges had a pulse that night. Despite Padilla’s botched scorecard, the win was historic for Hopkins who became the oldest boxer to unify world titles. In addition, the bout marked B-Hop’s second consecutive victory in the nation’s capital where he is 2-1 including wins over Shumenov and Robert Allen (TKO7). His sole loss in the District of Columbia was to Roy Jones Jr. in 1993. The victory set the stage for a potential fall showdown with The Ring/WBC Light Heavyweight Champion Adonis “Superman” Stevenson (24-1, 20 KOs), 37, presuming that he defeated Andrzej Fonfara (26-3, 1 NC 15 KOs), 27, in May. A bout with Sergey “Krusher” Kovalev (26-0-1, 23 KOs), 31, was also a possibility. The career path of Shumenov remained unclear. Summary: In their previous meeting, Nottingham’s Carl Froch (33-2, 24 KOs), 37, and Hammersmith’s George Groves (21-2, 16 KOs), 26, engaged in an all-UK brouhaha that ended in one of 2013’s most controversial stoppages. After Groves put Froch on his wallet in the opening stanza, courtesy of a hellacious right hand to Froch’s jaw, The Cobra shook off the cobwebs and battled back to register a 9th round TKO win. However, it was referee Howard John Foster’s disputed stoppage of the bout — which Groves was winning on all three scorecards — that drew the ire of boxing fans. Nevertheless, the stage was set for an all-out war in the highly anticipated sequel to the Battle of Britain: Froch vs. Groves. In the pre-fight build-up, Froch proclaimed, “I’d be absolutely shocked if stopping George Groves inside the distance didn’t happen.” Boy did the pride of Nottingham deliver on his promise. When these countrymen locked horns for the second time, in front of a sellout crowd at Wembley Stadium, it started as a chess match. From then on, Groves began to get his punches off first, which helped him get the better of several exchanges in the early rounds. Albeit a close fight, it looked as if Saint George was aiming to catch The Cobra with something big. By the middle rounds, however, the tide began to turn in Froch’s favor as he relied on his boxing IQ and volume to break down his younger foe. The Nottingham-native also punctuated several of his attacks with massive shots to Groves’ body and head. Groves had his moments as well. In the 7th round, for instance, Groves landed a neck-snapping, stiff left hand to Froch’s beard that staggered The Cobra. Froch would regain his composure and the rest of the round was nip-and-tuck with both fighters trading significant blows. Though Groves began to tire in the 8th round, it appeared that he had enough left in the tank to make it to the final bell and, perhaps, pull out a victory. Froch had other ideas. After setting-up Groves with a left-hand touch jab upstairs, which left Saint George wide open for a follow-up shot, Froch detonated a monster right hand on Groves’ chin. The punch floored Saint George with his leg folded under him. Groves was toast. Referee Charlie Fitch waived the fight off seconds later, but he could have counted to 15. It would not make any difference. Groves’ senses were scrambled and he was not fit to continue. At the time of the stoppage, Froch was leading on two of three scorecards. Yet, CompuBox stats showed that Groves was the more efficient fighter — landing 40% of his shots compared with Froch’s 28% connection rate. As in the Froch-Groves prequel, however, The Cobra was the busier fighter outlanding Groves by 35 punches — 349 vs. 314. With the win, Froch proved that his previous victory was no fluke and his moonshot KO was an instant candidate for knockout of the year. Given Froch’s level of competition, which is among the vanguard of active boxers, he could be well on his way to becoming a legitimate future Boxing Hall of Famer. Groves, who ended the fight with a shiner on his left eye, fell to 19 and 2, with 15 knockouts. Despite suffering back-to-back TKO losses, Groves closed out 2014 on a high note with wins over Christopher Rebrasse and Denis Douglin. Be on the lookout for Part II of my review where I’ll cover the remaining fights in detail. You are here: Home / Top Stories Boxing / The Year in Review: Six Notable Fights in 2014 – Part I — Pacquiao, Hopkins, Froch, More!